And probably a few others. Whatever it is called, it is a brilliant concept, with a threefold advantage. That is to save time, save money, make more efficient use of the storage area by eliminating all but 1 aisle. The shelving racks are mounted on wheels that are guided, either along tracks fixed to the floor, or in the case of Novalok’s unique ‘SKYTRACK’ System the wheels run on the floor and are guided by an overhead track. The mobile bays of shelving can be moved manually, or with mechanical assistance using a handwheel and geared chain operation, or in case of heavier loads, a powered system. Why choose mobile storage systems? High density storage has a number of benefits for a variety of businesses and organisations. By using mobile shelving, you can significantly increase the amount of storage you have, or better utilise the floor area. 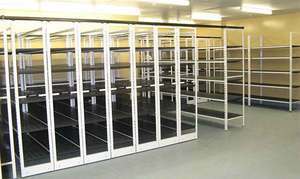 With high rent prices, it may be difficult to find a place that has enough storage, but by using roller racking systems, you can be more efficient in space utilisation, thus keeping your costs down. For those with a large amount of items, even the biggest of storage areas might not be enough, so by using roller racking systems, you can store more in less space. Mobile shelving is the perfect solution for those needing more storage space. With traditional racking, you need an aisle in between each row of shelving, but with roller racking systems, only one ‘mobile aisle’ is needed, with the rest of the room available for more shelving space. 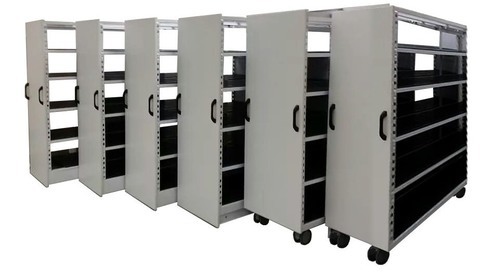 With high density storage, each shelf can be moved independently, either manually, with a chain operated turning wheel, or electrically powered for larger units. Either way, our mobile shelving systems are incredibly easy to use, and you’ll soon wonder how you ever coped without them. All of our roller racking systems are of the highest quality and provide real value for money. Prior to installation of your mobile shelving, you will require a site survey, before our qualified installation team come to do your installation. We have supplied high density storage to many organisations, including hospitals, doctors’ surgeries, universities, as well as factories and warehouses where high volumes of storage are required. So, for the very best range of quality mobile storage systems, Novalok has a solution for you. Contact Novalok for a recommendation today!